GS1 and VICS' announcement of an item-level RFID initiative might appear to be the formation of "just another technical working group." But it is actually one more indicator that we are finally at the "knee of the curve" of sustained exponential growth for UHF RFID. On November 1st, 2010, VICS (Voluntary Inter-industry Commerce Solutions), GS1 US, and GS1 Canada announced the formation of the ‘Item-Level RFID Initiative.’ This initiative will provide detailed guidelines for implementing item-level RFID, such as what data should be stored, how to encode tags, how to train employees, etc. VICS has had decades of experience—with UPC/barcodes, EDI, CPFR—in ironing out the practical details of standards and how they will be implemented. So we hope to see depth and clarification of lots of real-world interoperability specifics by the member companies. Working groups will include inventory tracking, point of sale, security, and probably others. Both VICS and GS1 have had item-level committees for years. So you would be forgiven for asking, “What’s the big deal about this announcement?” Partly it’s the fact that VICS and GS1 are working together along with the key retail and supply chain industry groups: AAFA (American Apparel and Footwear Association), CSCMP (Council of Supply Chain Management Professionals), NRF (National Retail Federation), and RILA (Retail Industry Leaders Association), as well as leading retailers, suppliers, solution providers, and academia. It looks like this effort is serious and noteworthy. But there is a much bigger story than the formation of this initiative and that is what’s been happening in the marketplace this year. Much of this surge has been due to item-level tagging in apparel retail. U.K. retailer Marks & Spencer has been doing item-level tagging for over seven years, with well over 100 million items tagged each year. But for years they were the exception rather than the rule. The last three years have seen numerous pilots, including the widely publicized one by Walmart this year. Now these are rolling into production. Item-level tagging is important for the RFID community because it drives high volumes. Stating the obvious, there are a lot more items than pallets or cases. This means that as volumes surge, prices will plunge. In the short term, capacity constraints may hold prices up for a while. But as new capacity comes online, and chip-makers have more money to invest in new techniques and technologies, prices will drop. We have already reached the long-anticipated 5-cent tag – the next major breakthrough is the 1 cent tag, and we will get there this decade, probably within the next 5 years. As prices plummet, it will open up more and more possibilities beyond apparel. In fact, Alien Technology said they are already seeing strong growth outside the retail sector. Item-level tagging will also make source tagging (tagging items where they are manufactured) much more widespread. This opens up opportunities for innovations in the end-to-end use of the tag, including chain-of-custody, warranty and service, etc. Item level tagging is an important step towards fulfilling the ‘Internet of Things’ vision enumerated by the Auto-ID Labs. For the two big EAS (Electronic Article Surveillance) vendors, Sensormatic and Checkpoint, the rise of item level tagging may mean that the day of reckoning is finally at hand… or not. Both have known for years that they have to deal with RFID, and have dabbled in various strategies. 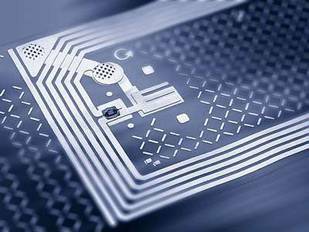 It remains to be seen for how long RFID tags will coexist with EAS, or when RFID will be merged into or replace EAS.